Despite playing the majority for the second half with 13 men, Banagher had five points to spare over Lavey as they booked their place in the county final. First half goals from Jonathan O’Dwyer, Darragh Cartin and Oisin McCloskey sent the men in maroon into an eight point lead 10 minutes before the break. Majors from Christopher Henry and Fintan Bradley dragged Lavey back into the game, setting up an absorbing game of hurling which was still in the melting point right down to the wire. Six separated the two teams at the break with Lavey only outscoring Banagher 1-6 to 0-8 in the second period despite their numerical advantage for the bulk of proceedings. Ten minutes in to the second half, Banagher were down to 13 with Jack Phelan and Oisin McCloskey seeing red for two separate incidents. Points from Shane Farren, Tiernan McCloskey from placed balls and a wonder save from Darrell McDermott, Banagher kept Lavey at arm’s length and, in truth, St. Mary’s never looked in any danger despite their disadvantage. Lavey threw everything they could at their opponents in the dying embers but found themselves susceptible to counter-attacks against a Banagher attack brimming with confidence. Oisin McCloskey opened the scoring from a narrow angle before Tiernan McCloskey doubled the advantage. Lavey got their first score in the forth minute and it was one for the purists. Michael Maguire’s puck-out found Brendan Laverty who wasted no time striking over the bar from range, the ball going from one end to the other in two pucks. Eamon McGill levelled before Darragh McCloskey edged his team in front once again. Dermot O’Neill restored parity for the second time in the game before Darragh Cartin’s goal bound shot proved too hot to handle with Michael Maguire unable to prevent it from hitting the top corner of the net. The breath-taking start continued as Brian Og McGilligan fired over the top before Darragh McCloskey picked out Jonathan O’Dwyer who showed real strength to emerge from a crowd of orange jerseys before riffling into the back of the net. Liam Murphy stopped the rot before Ryan Farren added another as Lavey looked to chip away at the deficit. With 14 minutes on the clock, Banagher had their third major to lead by eight, Oisin McCloskey beating three men before shooting low into the bottom left corner. The men in orange and black needed a response and got just that when Liam Murphy jinked through a packed defence to find a yard to tap over the bar. Seconds later, Lavey had a goal of their own, Paddy Henry’s long ball finding Fintan Bradley who made no mistake firing into the net. Henry grabbed a score of his own from the next attack before Lam Murphy nailed a 65’ and all of a sudden there was only a puck of the ball between the sides. Tiernan McCloskey and Liam Murphy traded scores before the break before Darrell McDermott made a wonder save from Paddy Henry with the last action of the half to ensure his side led 3-8 to 1-8 at the break. Henry grabbed the first score of the second half from a placed ball before Banagher were reduced to 14 five minutes into the half with Jack Phelan seeing red. Two minutes later the north Derry side were down to 13 as Oisin McCloskey was issued with a red card. Twelve minutes into the half Shane Farren registered his team’s first of the half, prompting massive cheers from the stand. The game was being played at a frantic place and with the hits flying in Chrissy Henry found Ryan Farren who struck over the bar. Banagher replied with Shane Farren shooting over before Tiernan McCloskey restored the eight point lead for his men. Brian Og McGilligan added another and will have Sean McCullagh to thank after his midfield partner made a huge catch in the middle sector. With the game entering the final 10 minutes, Lavey needed inspiration which was duly provided by Eamon McGill who nailed a side line cut in front of the stand before Chrissy Henry fired the ball into the net to cut the deficit to four. Tiernan McCloskey added another free to bring his tally to 0-5 with little left of normal time. Lavey still had time though as the fourth official’s board indicated that there would be seven minutes of additional time. Eamon McGill once again led by example and cut the arrears to three before Sean McCullagh replied with a score of his own from long range. Despite having time on the clock, Lavey went in desperate search of a goal and their prayers could have been answered when Brendan Laverty lined up a shot only for a perfectly timed block from Shane Murphy. Ruairi McCloskey and his defensive unit, backed by a sweeper in Mark Lynch, held firm from the aerial attacks that would follow only coughing up a point to Liam Murphy. The final action of the game would fall to Tiernan McCloskey who led his teams scoring charge nailing yet another free to put the icing on the cake. It is Banagher who will contest yet another county final against reigning Derry and Ulster champions Slaughtneil in what promises to be a titanic tussle on September 30th. Banagher: Darrell McDermott, Gabriel Farren, Ruairi McCloskey, Shane Murphy, Darragh McCloskey (0-1), Mark Lynch, Niall Farren, Brian Og McGilligan (0-2), Sean McCullagh (0-1), Jack Phelan, Oisin McCloskey (1-1), Darragh Cartin (1-0), Tiernan McCloskey (0-8 6f), Jonathan O’Dwyer (1-0), Shane Farren (0-3). 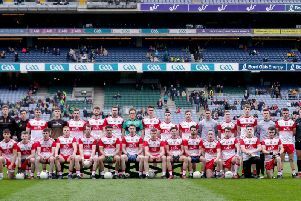 Lavey: Michael Maguire, Sean Toner, Colm Dillon, Dara McPeake, Conor McGurk, Dermot O’Neill (0-1), Shane McGill, Eamon McGill (0-3), Brendan Laverty (0-1), Odhran Waldron, Christopher Henry, Ryan Farren (0-2), Liam Murphy (0-4 1f 1 65’), Paddy Henry (0-2 2f), Fintan Bradley (1-2).